Why Should Schools Have Salad Bars? Over ten years ago, when I was the Director of Nutrition Services at Berkeley Unified School District, I implemented Salad Bars in every school in the district for all of our K-12 students. When I began the program, there was a fair amount of “push-back.” I heard statements like; “little kids can’t eat off of salad bars,” “salad bars are sanitation nightmares,” “older kids will spit in them,” “they cost too much,” “there’s too much waste,” and “they take too much payroll.” A decade later, the Let’s Move Salad Bars to Schools program (a partnership of the Chef Ann Foundation, Whole Kids Foundation, United Fresh Start Foundation, and the National Fruit and Veggie Alliance) has raised $13M, donated almost 5,000 salad bars to schools in every state, and is serving 2.4M students. All that being said, the questions about the practicality of salad bars in schools still persist: are they safe, do they cost too much, how do you control portion sizes, how do you control waste, and how do they fit into the USDA guidelines? Given all of the research that connects the health of our children to increased fruit and vegetable consumption, I think we can all agree that incorporating salad bars into school lunches can positively impact our children’s lives. Now let’s move on to the perceived barriers to implementing a salad bar. Our experience in school districts is that salad bars cost between 22 and 35 cents per student. Granted, this is a significant percentage of the USDA reimbursement rate, but the cost can be covered by replacing fruit and vegetables on the “plate” with choices from the salad bar. In essence, instead of serving a hot vegetable and a piece of fruit with every meal, put fruit and vegetable choices on the salad bar. There are numerous ways to incorporate current payroll into salad bar implementation. The two areas where issues arise are in prep time and service oversight. From a preparation standpoint, it is often possible to incorporate fruit and vegetable prep into the staff’s current workload. We’ve found that once trained, staff members embrace salad bar production. The positive feedback from the students and adults, and the appearance of their salad bars are often a point of pride. If staffing levels don’t allow for this type of production, then produce can be purchased pre-cut from most produce companies. Per the USDA guidelines, there needs to be staff oversight of salad bars. Specifically, salad bars need to be monitored. Our recommendation is that salad bars be placed before the cashier who can monitor them. The cashier and the servers can also be responsible for refilling and cleaning the bars. Restocking is best accomplished by pre-filling extra salad bar containers before service to ensure timeliness in the refilling process. Food waste has become a hot-topic nationally and is of great import in schools where a balanced budget is critical. The challenge with salad bars is the trade-off when you allow students to choose from the salad bar and “self-serve” rather than providing portion controlled or “pre-cupped” servings from the line. The resolution to this issue is education and training. We have successfully utilized signage such as “Take What You Want—Eat What You Take” posters that visualize portion sizes and “show-plates” with actual portion sizes on them. These materials can be found in the Salad Bar section of the Lunch Box. One of the most common issues we hear regarding salad bars is food safety. Students might pick up food with their hands and utensils could pass along germs and contaminate the food. As a rebuttal to those fears, we researched foodborne illnesses on salad bars and as far as we know, there has NEVER been a foodborne illness outbreak from a school salad bar. That being said, education is key and there are numerous tools in the Salad Bar Guide, which is on the Lunch Box that you can look to for guidance. Salad Bars can actually decrease compliance issues. 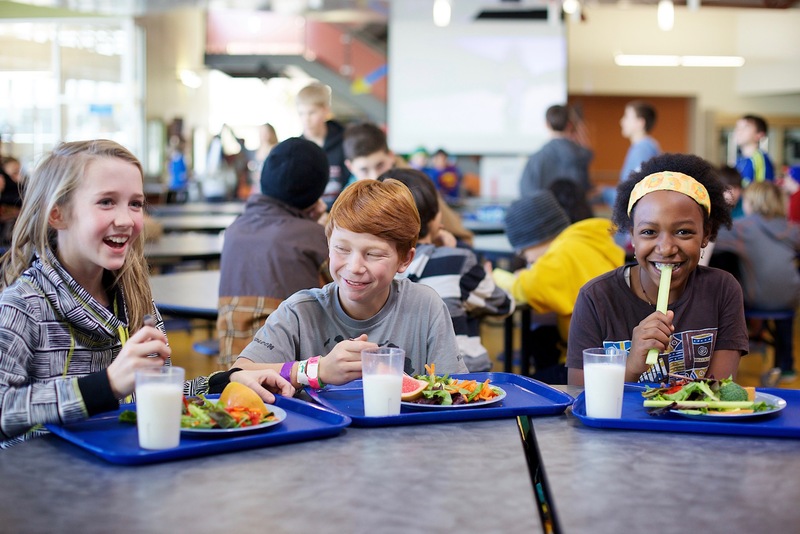 With the rollout of the Healthy Hunger Free Kids Act, the USDA enacted guidelines on the amount of whole grains, protein, fruit, and vegetables that must be offered or served at lunch. Further, the guidelines dictate the various colors that must be served during the course of a week—salad bars help assure these guidelines can be easily met. When your reimbursable lunch includes a salad bar, you must have a salad bar recipe, which ensures that all the items that are on the salad bar become part of the meal’s recipe. The recipe and the salad bar production record are explained in the above-mentioned guide as well as in the Salad Bar section of the Lunch Box. But to put it simply, when fruit and vegetables are served from your salad bar and are included in the recipe that meets the weekly color guidelines, your salad bar assures compliance. Whole grains and protein can augment your lunch entrees in the same fashion, which allows for menu flexibility. In Boulder Valley’s schools, all of our salad bars always include: a whole grain salad, three types of protein, and vegetable colors that assure compliance. It really works! The Lunch Box provides salad bar recipes, whole grain salad recipes, and salad dressing recipes. I often hear that schools can’t implement salad bars because it takes too long for the students to make their choices and that it “holds-up’ the line. I believe that we need to extend lunch periods as opposed to make all of the food we serve “fast-food.” But until then, this too is an education issue. Both students and food service workers need to be trained and educated on efficiencies. Once students understand the procedures, they can move through the lines in a timely fashion, making their choices and still having time to eat. Salad Bars are one of the best initial changes a school district can make to show their community that they’re making positive change in their food program. Implementing salad bars in schools gives students choice; allowing them to taste new flavors, expand their pallets, and begin to enjoy healthy food. Salad Bars help increase participation as parents see healthy, fresh food being offered to their children, and as students are allowed to make their own choices from the salad bar. 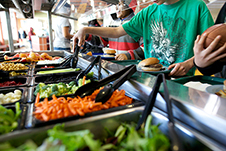 In our most recent evaluation, 68% of schools that implemented salad bars saw an increase in ADP. There’s so much more to learn about salad bars, from procurement to marketing, training, and financial management, all of which can be accessed on the Lunch Box in the Salad Bar section. I hope you’re inspired to implement salad bars in your schools. They are truly the best way to get kids eating more fruits and vegetables!